Former Dragons’ Den co-host Arlene Dickinson has joined the chorus of Canadian business leaders voicing concerns about anti-immigration sentiment and travel restrictions south of the border. During a speech in Toronto Thursday, Dickinson didn’t specifically refer to U.S. president Donald Trump’s restrictions on travel from seven predominantly Muslim countries. But she called for inclusiveness and recalled her own experience as an immigrant from South Africa. “I’m such a proud Canadian and I’m so glad my parents came here. And I think about what’s happening in the world …” she said before choking up with emotion. Shortly after taking office in January, Trump signed an executive order temporarily banning travel to the U.S. from Iran, Iraq, Syria, Libya, Somalia, Yemen and Sudan. That prompted more than 2,000 Canadian technology executives to sign an open letter to Prime Minister Justin Trudeau. Endorsed by companies such as Spotify, BlackBerry and Google Canada, the letter expressed concern the U.S. ban would stifle global innovation and promote “marginalization of people based on their birthplace, race or religion.” Although the 9th U.S. Circuit Court of Appeals suspended Trump’s executive order, the White House has promised to introduce a revised version. Silicon Valley heavyweights – including Facebook’s Mark Zuckerberg, Apple CEO Tim Cook and Tesla founder Elon Musk – have also voiced worries about the potential impact of travel and immigration restrictions on current and future employees at U.S. technology companies. 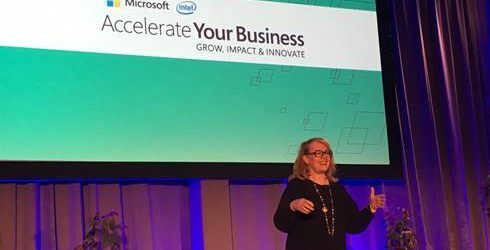 Dickinson highlighted her own immigration story Thursday at Microsoft Canada’s Accelerate Your Business event for small and medium sized businesses. That journey took her from impoverished immigrant (after arriving in Canada, Dickinson’s father had to trade his wife’s wedding ring for a badly needed used car) and broke single mom to successful entrepreneur and reality TV star. It was a rough road. She married at 19, had four kids by 30, endured a bitter divorce and custody battle, and got fired from her first job after re-entering the workforce. Then a former coworker took a chance on Dickinson and hired her at Venture Communications. After working her way up the ladder there, she eventually bought out the Calgary marketing firm and became its CEO. CBC did hire her, of course. Dickinson spent seven of her eight years on the show sparring with O’Leary, who is now taking a run at the national Conservative Party leadership. While Dickinson reiterated Thursday she has no political aspirations of her own, she did urge Canadian entrepreneurs to stop leaning so much on government for financial support and incentives. In 2015 Dickinson launched District Ventures, an accelerator for consumer packaged goods (CPG) startups in Calgary. Last year she led the drive to start a $25-million venture capital fund devoted to Canada’s CPG sector, investing $1 million of her own money to kick off the project. There are signs Trump’s travel ban may actually be helping Canada lure talent away from the U.S. According to figures reported in early February by Global News, undergraduate applications from the U.S. were 80 per cent higher at the University of Toronto than the same time last year, 34 per cent higher at McMaster University and 21 per cent higher at McGill University.